Ovi magazine thematic issue #24 "Nationalism"
No doubt we did find a very challenging theme for our first thematic issue for 2013. Challenging in just too many levels. First of all we decided after a conversation with the Ovi writers’ team to focus in ‘Nationalism’ this time. And then it was something I’ve been thinking for long time; that eight years after its birth, the thematic issues of the Ovi magazine needed some kind of renewal in every single level. 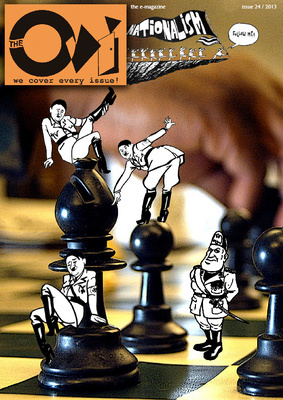 With the magazines and the newspapers entering a new era where their print form gradually retreating and the same time more and more of the traditional magazines entering the only internet era - latest example the long lived and popular Newsweek – we felt that it was time for Ovi magazine to upgrade, evolute. And in a very twisted way it is partly because of the popularity and visitation. In Ovi magazine we are very proud for our diversity, for our freedom of speech and expression. We pride our democratic attitude and tolerance and we think that we are adding something in the global democratic development. The same time all these eight years but especially the last two we have been awarded with an amazing and constant increase of readership. So we should firstly give something more to our readership regarding both quality and quantity and the same time reach more people. Please don’t misunderstand me; Ovi is a non profit publication and everybody contributes from writing, drawing even helping with the actual technical part voluntarily. There is absolutely no profit here. But we have a message and a battle to give, especially during our times turbulent with a variety of issues from political to financial or even existential. And Ovi since its foundations was created out of frustration and need for expression. The Ovi magazine, the Ovi thematic issue and the Ovi special issues are something unique in the world of the eZines trying to combine traditional magazine print forms with the endless possibilities internet gives. And we should try to make the best of it. Like everything else in Ovi magazine there is a constant evolution, we try to correct, change, adapt if necessary; always inside the red lines we have mark ourselves. Tolerance, democracy, freedom of speech, respect, anti-racism, anti-fascism. And since I talked about our red lines time to return to the theme of this issue. Nationalism. And I must admit that in the beginning except the challenging of the issue I felt a certain enthusiasm seeing in it a good chance to exhibit all the above. Then questions started. So what is nationalism and how you identify nationalism. As oppose to patriotism or as a partner to fascism? Hitler was a nationalist; he actually flagged the word as the essence of his philosophy. But Stalin and Mao were also nationalists in their own very unique and twisted way. What about Argentina’s Peron. And why the most nationalistic elements of the British populist spectrum admire Margaret Thatcher? Was Yasser Arafat a nationalist or a liberator patriot and then what does that makes the Iranian mullahs and the Afghani Taliban? And the same time the Lapi people, the indigenous that live in a non existent situation between Russia, Finland and Sweden they also talk about the nation and need for national unity. Again the words “nation,” “nationalism” jump here and there always with different meanings and approaches. Semantics you might say. I absolutely agree. It is about semantics but how far semantics can excuse a holocaust in the name of nationalism? Now we are all more confused since we are talking theoretically about something that has cost millions of lives. In this thematic issue of the Ovi magazine we are not giving answers about “nationalism.” We simply express opinions. We also start a dialogue with only aim to understand better. That’s why we invite everybody to participate and you can do that in our magazine. You can do it commenting or sending your own opinion/essay/article and we promise to publish it. Ovi magazine with the 24th thematic issue, welcomes you to a new era and effect. A big thank you to all the contributors of the Ovi magazine for their daily participation to the big or small battles we give, a big thank you to the Ovi friends and a huge thank you to all the Ovi readers from all of us. We sincerely hope that you will enjoy this issues of the Ovi thematic magazine, what remains is to ...download it from HERE! You have outdone yourself mate (as the Australians would say) This is something you and everyone at OVI should be proud of. Congratulations Thanos and all contributors. No doubt about it, Thanos: it was a challenge that you threw at us and we have probably barely scratched the surface of the theme, but hey, as Nietzsche used to say: whatever does not kill us makes us stronger. Congratulations on a job well done. Thank you to all of your gifted contributors ! Well done ! And I love the Chess Board.